Hosting a party anytime soon? You might have arranged for the alcohol and the food, but there are some offbeat party essentials you don't want to miss out on. Check out these fun party props that'll kick the night up a notch. Couple of hours into the party and people still sitting sober? Whip out the drinking roulette game, fill up the shot glasses, and let it rip. If the number played is the same as the one on your shot glass… well, you know what to do. If you wake up on Sundays asking yourself how much you ended up drinking the night before, here’s a handy little gadget for you. This beer tracking opener will count the number of bottles you popped open — a great way to keep tabs on those beer pong nights. If you’re throwing a party, might as well pour the drinks in style. 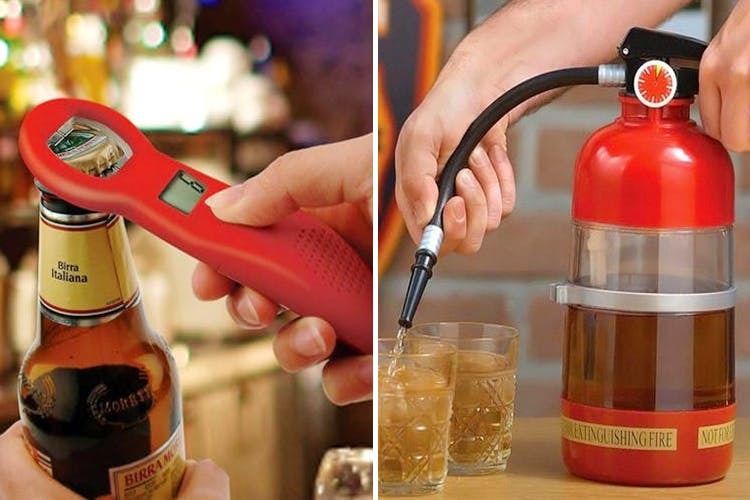 Check out this fire extinguisher — it’s up to no good if there’s a fire, but it serves drinks like a boss. Just pump the handle and watch the cocktail pour. It has a capacity of one litre. Is it even a party if you don’t karaoke the hell out of Wonderwall and Summer of 69? This wireless karaoke mic has a built-in bluetooth speaker, has a memory card slot for all the tunes, and connects to iOS and Android apps for some extra karaoke effects. You can even answer calls with it — imagine roaming around the house talking through a mic when you talk to your BFF. If your idea of a party is a few beers with a never-ending session of poker hands, this poker set is your new friend. It comes in an aluminium briefcase (pro already?) with 100 chips, 1 dealer button, 5 dice, and 2 decks of playing cards.